One of my earliest memories is of my mother taking me to her weekly Country Women’s Association meetings while my older brother and sisters attended school. We lived on a farm just outside Wagga Wagga and my mother attended a small rural branch of the CWA near the farming community of Brucedale, where we lived. The CWA meetings were held in a weatherboard hall surrounded by patchy, brown grass and a few stands of eucalypts and pepper trees. While the official meeting was in progress, the children were sent outside to play. I was a reclusive farm kid, so I remember mostly standing round under the scrappy shade of a pepper tree, in an agony of shyness, waiting for the meeting to end and the lunch or morning tea to begin. Every woman bought a plate of some savoury (mostly sandwiches) or sweet baked goods. I particularly loved the luncheon sandwiches at these countrywomen’s feasts and then there were the cakes, slices and other assorted treats that were always served in dainty pieces so that you have an assortment of sweet and savoury offerings on your plate. There was a competitive edge to the bringing of plates to these affairs, so the food was always good and in amongst all that variety, there would always be a plate of scones halved, spread with jam and centred with a dollop of whipped cream. 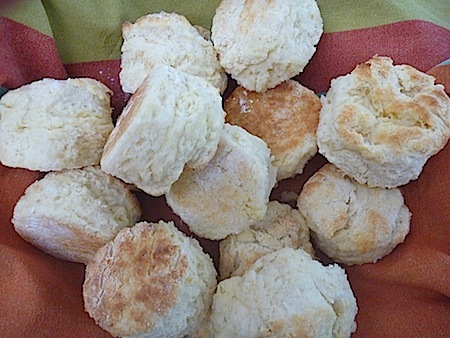 Scones are a great staple of the traditional Australian morning and afternoon teas. They are best baked just as your guests are arriving or even after they have arrived – there is no shame in having your guests wait, because what could be better than a scone that is fresh out of the oven. I always associate them with the best of country hospitality, because they are made from pantry staples and can be whipped up at a moments notice when unexpected guests arrive. Over the years, I’ve many made variations on the basic scone but I’ve finally settled on these buttermilk scones as my favourite. They have a nice density and lightness at the same time, and the buttermilk, as always, adds a nice flavour note. These scones are best cut into small 5 cm rounds and so remind me of those shared plates of dainty scones from my childhood. I often make these scones for my son and his friends as an after school treat. They are so simple and quick to make but there is something so gorgeous and celebratory about a plate of scones with jam and cream that children, in particular, seem to love. Note: The only secret to making light and tender scones is to not to overwork your dough and to bake them in a very hot oven. I usually wrap my scones in a tea towel after taking them out of the oven so they keep warm and moist. Let the scones cool slightly before slicing in half, spreading with jam and adding a dollop of whipped cream. From Margaret Fulton – Encyclopaedia of Food and Cookery. Sift all dry ingredients into a mixing bowl. Rub in butter until mixture resembles breadcrumbs. Add just enough buttermilk to make soft dough. Turn out onto floured board. Knead lightly, then pat or roll the dough to about 1 cm (½ inch) thickness. Cut into rounds with a 5 cm (2 in) cutter. Place on ungreased baking sheets with scones just touching. Bake in a very hot oven (230°C/450°F) for 10-12 minutes until golden. there are so many quick ways to make scones which avoid the (rather tiresome lets face it) rubbing of the butter into the flour.yet I cannot convince myself the texture of these variants is quite correct.and what about the date scone served with butter?like marmalade perhaps a taste that develops with age,as a child I considered it a great waste of scone. These look amazing Elizabeth. I am definitely going to give them a go. I’ll be trying these too!